I was working at the Humane Society of Charlotte when we saw an urgent post on Facebook about a pit bull in Georgia in need of a home. Like every shelter, we get dozens of similar requests every week, but there was something special about this girl. Her previous owners were convicted of animal abuse – Peaches was kept at animal control for over a year as evidence. Now that the case was over, the county wanted to euthanize her since they no longer needed her. This seemed so unfair for this sweet girl! A wonderful group of volunteers from Georgia and Florida organized transport and vet care – four days later, Peaches arrived at the humane society. I fell in love with her at first sight. We normally don’t find foster homes for adult dogs, but I couldn’t resist bringing her home with me that night. She was a little nervous at first, but soon figured out that the sofa was soft, the treats were yummy, and the cat was friendly. 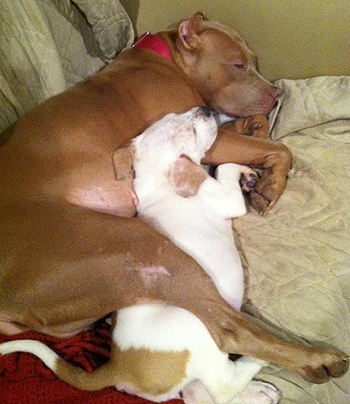 My husband was initially hesitant – he was convinced that all pit bulls were vicious man-eaters. Peaches made it her mission to convince him otherwise, jumping right in his lap and covering him in kisses. It took all of two hours for us to decide that she was meant to be our newest family addition. After adopting sweet Peaches, I began working with the American Pit Bull Foundation because of my passion for the breed. Earlier this year, she won the voting contest to be the 2012 APBF Masccot. 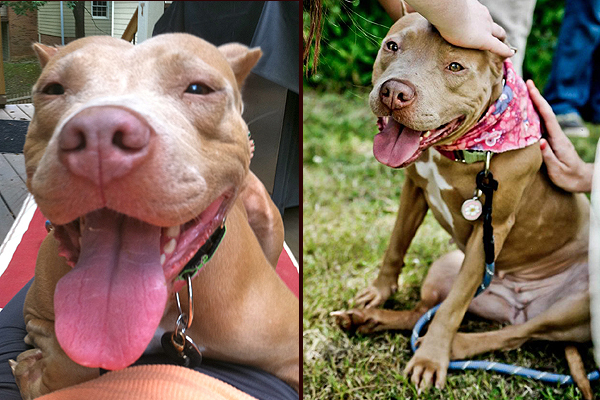 She’ll also be featured in an upcoming Pinups for Pitbulls calendar – she’s come quite a long way from an animal abuse case! We can’t imagine our life without Peachie Pie. Despite her tough start, she is a gentle, goofy soul. Peaches passed her Canine Good Citizen test after only six months and received her therapy dog certification through TDI in a year. She’s a true ambassadog for the breed and changes minds wherever she goes. You can follow Peaches The Wonder Pit on Facebook. Beautiful pictures. Thanks for not allowing Peaches to die. @ehsutherland Peaches is such a wonderful example of a breed ambassador! We are so honored to feature her here on StubbyDog. Go Peaches! Way to Rep the cause! Go Peaches! It amazes me that she was planing to be euthanized after all she went through. Thank you for saving her; there’s another great ambassador! @starscreeam. Tummy rubs are every pit bull’s due.